The 70th-anniversary festivities included the Arirang Mass Games, a huge, choreographed event held at May Day Stadium in Pyongyang. Hundreds of dancers, tumblers and musicians performed, while more than 17,000 students in the stands flipped cards to create massive images. 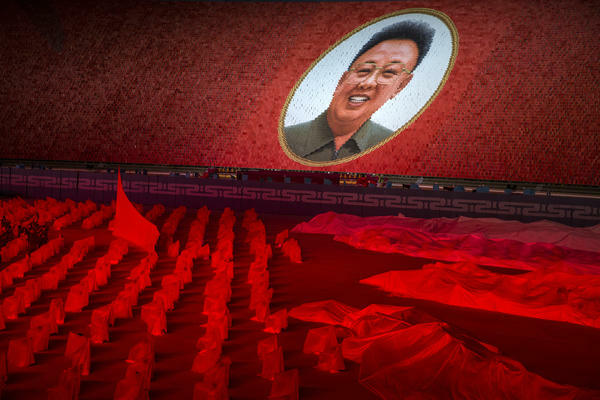 Here, cards form a portrait of the late leader Kim Jong Il, who died in 2011. His son Kim Jong Un has ruled the country since. A Russian journalist uses a selfie stick to record a stand-up at a collective farm in Pyongyang, as his government-provided guide watches. Mosaics like this are found throughout the country and commemorate visits by North Korean leaders. Many places in North Korea commemorate the visits of a leader with portraits, photos and other relics. 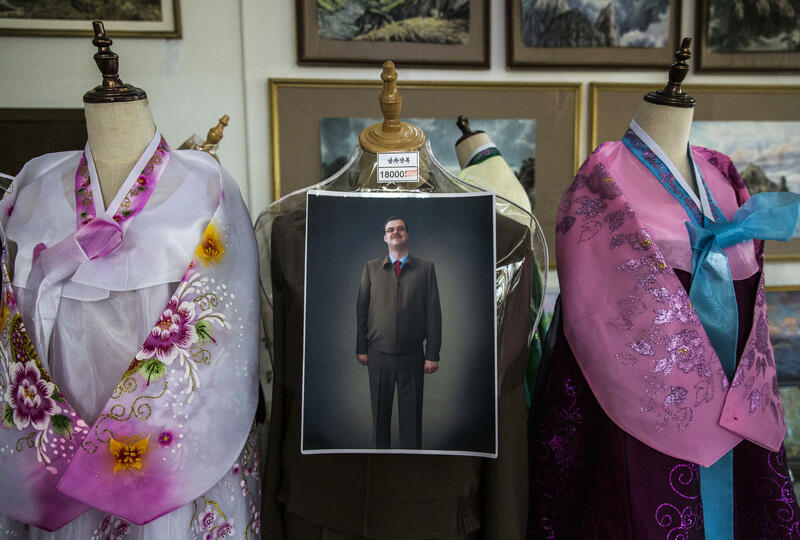 At this cosmetics factory in Pyongyang, a set of rooms is dedicated to visits by all three leaders of North Korea: Kim Il Sung, Kim Jong Il and current leader Kim Jong Un. 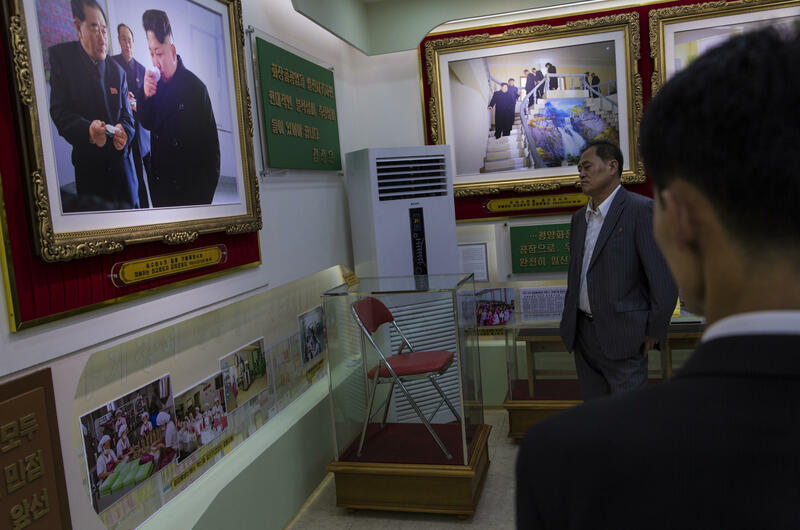 Here, a folding chair used by Kim Jong Un is displayed under a glass case. 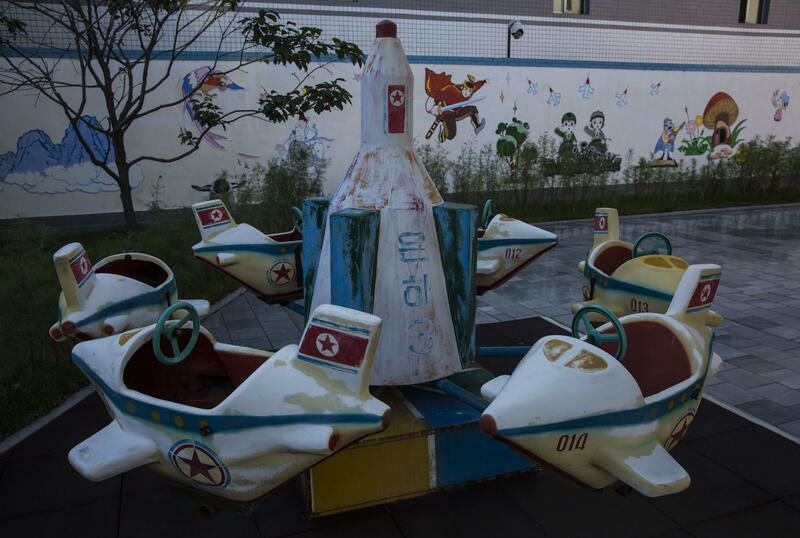 Playground equipment at a silk factory in Pyongyang is modeled after the Unha-3, a long-range rocket North Korea successfully launched in 2012. The Unha-3 is commemorated in framed photography, postage stamps and playground equipment across the country. 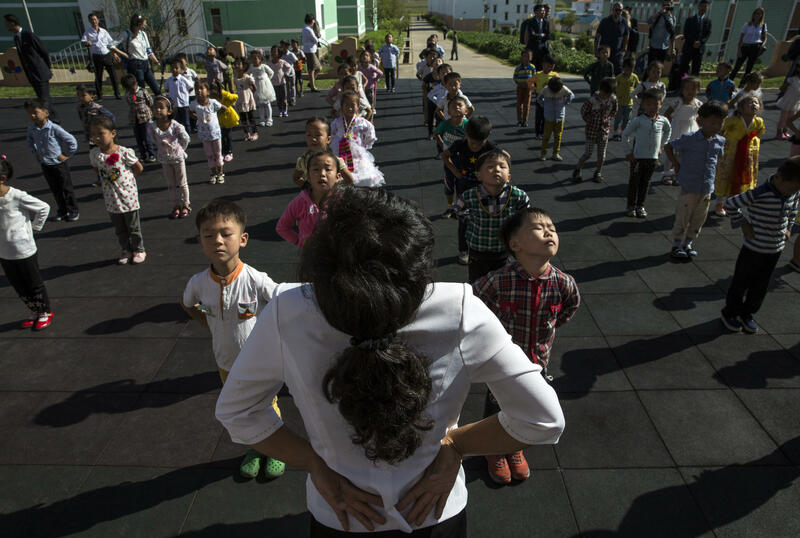 A teacher leads students in singing and dancing outside a school on a communal farm in Pyongyang, as foreign journalists observe. Government-provided guides stand by as foreign journalists wrap up a tour of a teachers college in Pyongyang. A view of central Pyongyang from the top of Juche Tower, a monument dedicated to the state ideology of self-reliance. The tower is about 3 feet taller than the Washington Monument. A government-provided guide stands at the balcony. In the distance is the 105-story Ryugyong Hotel, which has been under construction for more than 30 years. 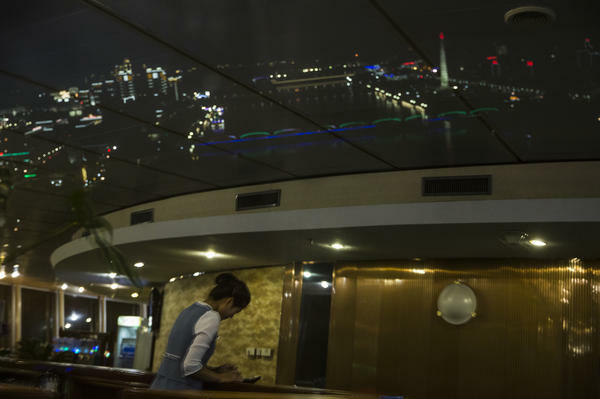 Pyongyang at night, as viewed from a revolving restaurant at the top of the Yanggakdo Hotel. 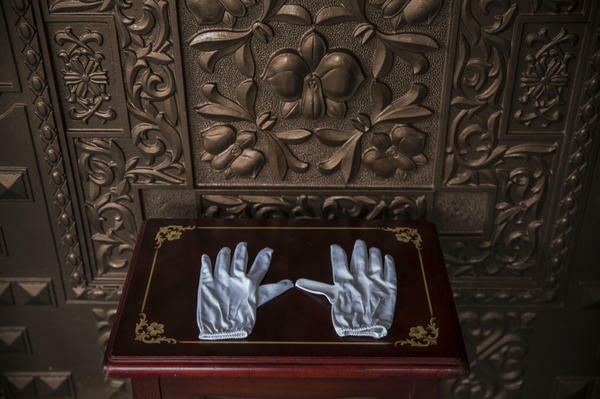 At the International Friendship Exhibition Hall in Myohyangsan, a mountain resort about 90 miles north of Pyongyang, visitors must use this pair of gloves to open the heavy entrance doors. 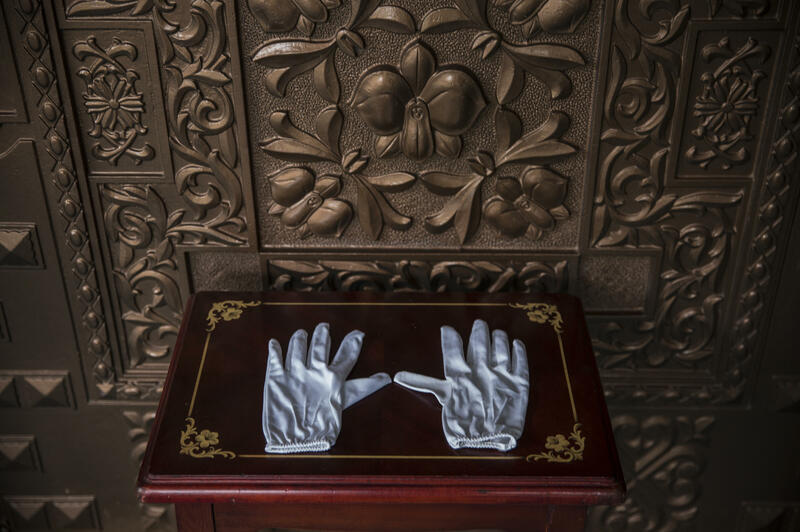 The museum contains nearly 115,000 gifts presented to North Korea's leaders since 1948. They include bulletproof cars from Josef Stalin and a basketball with Michael Jordan's signature from Madeleine Albright. 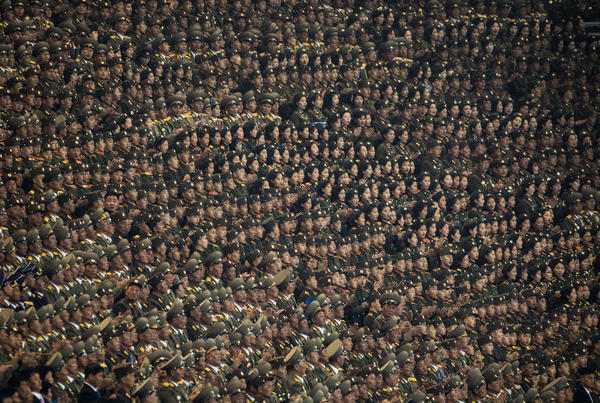 Members of the North Korean military sit in the stands of Pyongyang's May Day Stadium during a debut of a new Arirang Mass Games event to mark the 70th anniversary of the nation's founding. 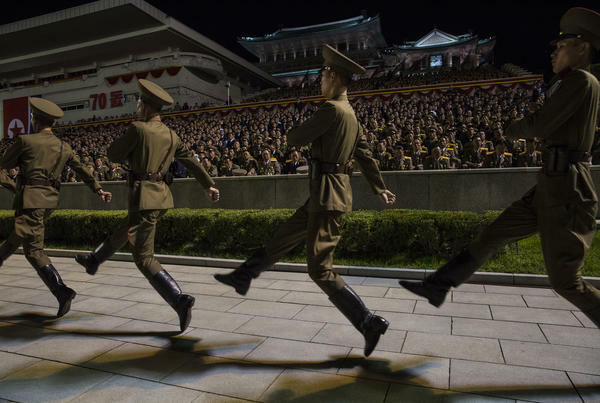 Goose-stepping soldiers mark the beginning of a massive torchlight parade to commemorate the 1948 founding of the Democratic People's Republic of Korea. A house band performs a lunchtime set at an Italian restaurant in Pyongyang. North Korean leader Kim Jong Un is regarded as ushering in an era of comparatively relaxed fashion, hairstyles and popular culture. 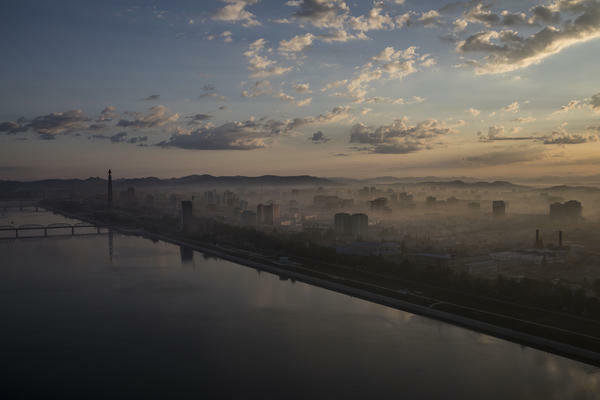 Pyongyang and the Taedong River at dawn, as viewed from the Yanggakdo Hotel. The hotel is located on an island in the middle of the river, isolating it and its guests from the rest of the city. 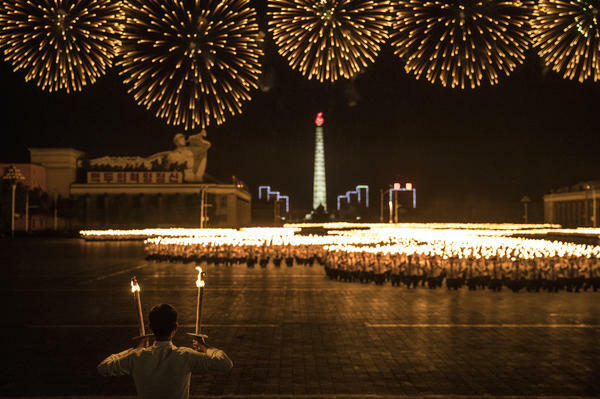 North Korea often houses visitors there, including all of the foreign journalists covering the 70th-anniversary celebrations. Behind the glass, a worker at a cosmetics factory in Pyongyang. 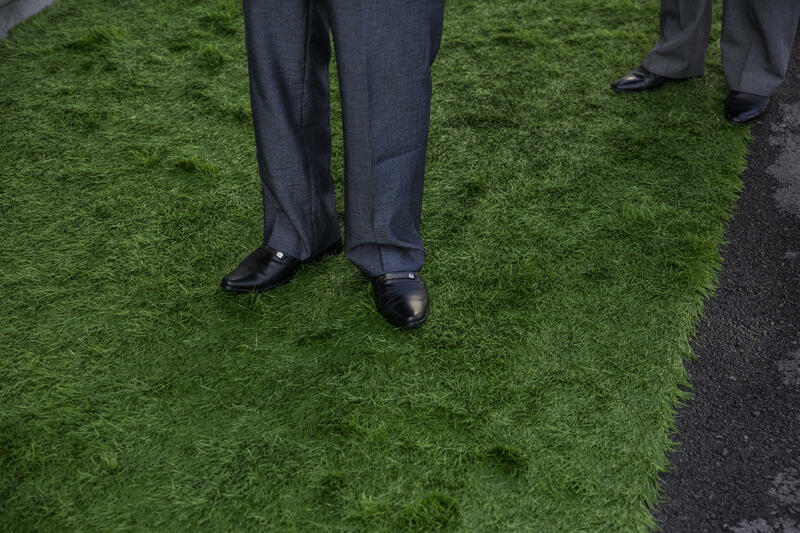 A photograph of Kim Jong Il that commemorates a visit to the factory is seen in the reflection. 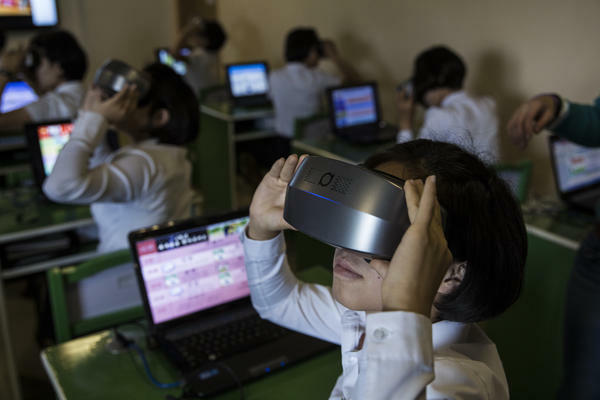 At a teachers college in Pyongyang, students and administrators repeatedly showed off technology, including laptops, holograms, interactive virtual students and these virtual reality headsets. 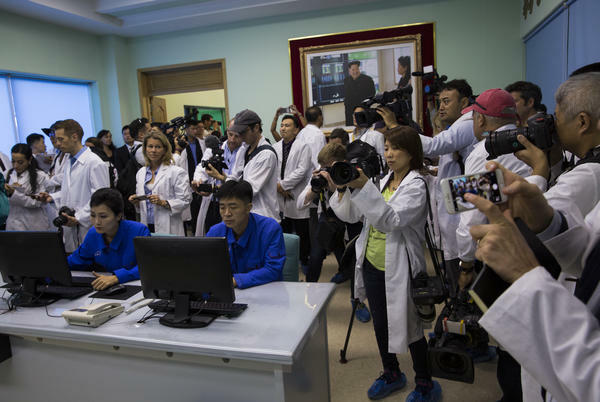 Dozens of journalists tour the operations room at a cosmetics factory in Pyongyang. More than 150 foreign journalists were invited to cover the 70th anniversary of North Korea's founding. 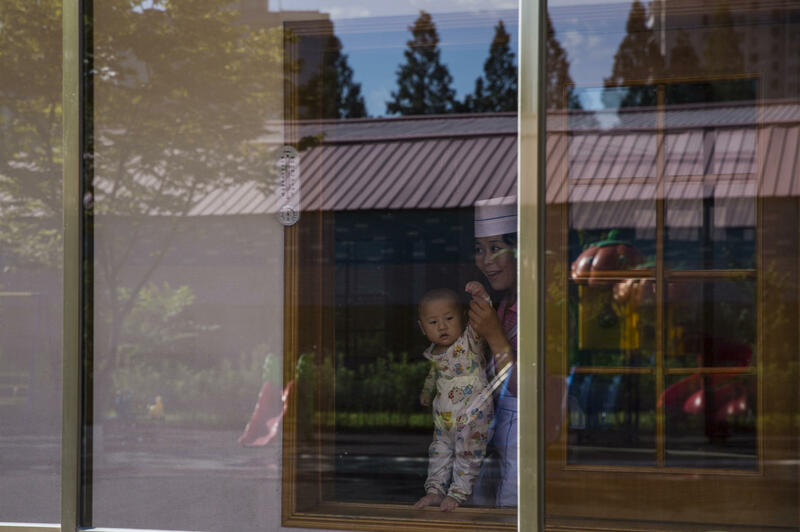 A woman brings a young child to the window to see visiting journalists at a nursery on the grounds of a cosmetics factory in Pyongyang. Pyongyang viewed from the top of the torch-tipped Juche Tower. Security guards with metal detector wands line up ahead of an orchestra performance at the Mansudae People's Theater in Pyongyang. Behind them is a portrait of Kim Jong Il, North Korea's second leader, standing at the top of Mount Paektu — the spiritual home of the Korean people where, according to official North Korean mythology, Kim was born. 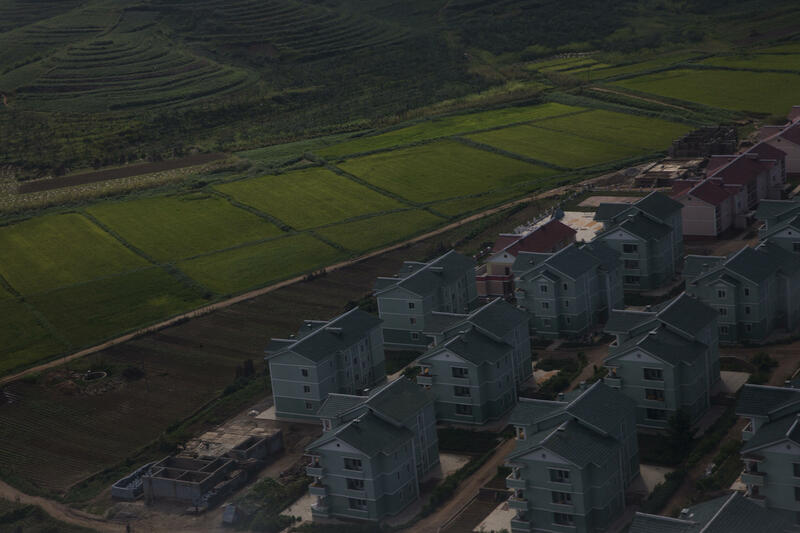 Apartments and a farm on the outskirts of Pyongyang, as seen from the air. 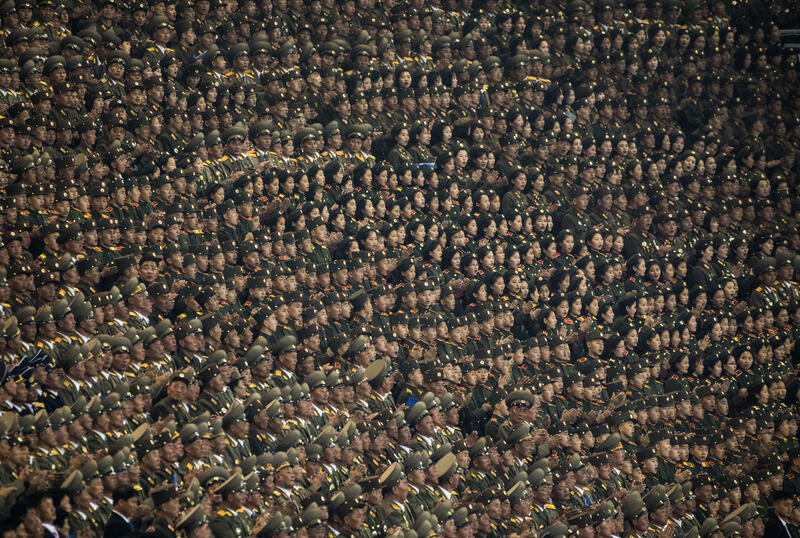 Military officials await the start of a military parade at Kim Il Sung Square. 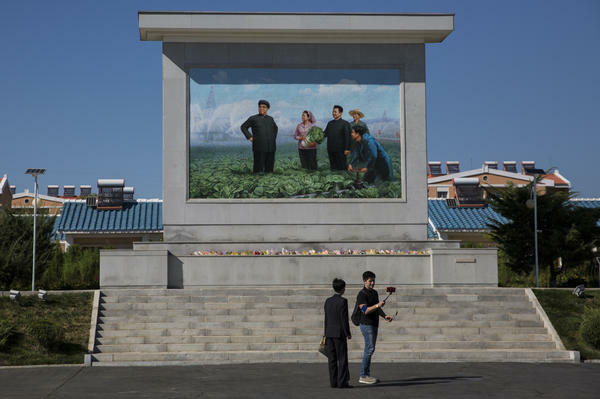 There was once only a portrait of the country's founder, Kim Il Sung (left), at the square. 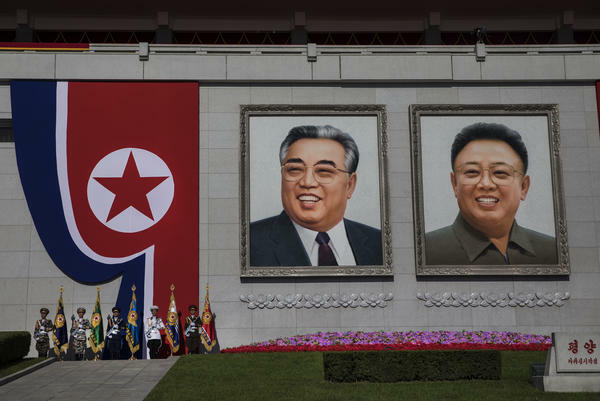 The portrait of his son and successor, Kim Jong Il, was added after the younger Kim's death in 2011. After just seven years under the rule of Kim Jong Un, North Korea is in a moment of change. Most visibly to the outside world, Kim — the third generation of North Korea's founding family to lead the nation — has made 2018 a year of unprecedented diplomatic engagement, with South Korea and the U.S.
Signs of change are visible inside the country, too. Once thought of as a Stalinist relic preserved in amber, with empty streets, cold gray buildings and an outdated airport, Pyongyang of today looks increasingly modern, as do a handful of other cities targeted for development. Conditions are worse in less favored areas — there are still shortages of food and electricity — but the country's economy is improving despite sanctions, and, overall, quality of life has come a long way since the famine of the 1990s. It is hard to know what this flurry of modernization and diplomacy means for North Korea in the long term. Sanctions remain in place. The vast majority of North Koreans still can't travel freely, access the global Internet or express any sentiment about the leadership other than praise and gratitude. There's no guarantee that the authoritarian, dynastic regime can survive dramatic changes to the country's economy and a growing awareness among North Koreans of the quality of life outside their borders. But it was in this moment of engagement with the outside world that North Korea chose to invite us in. During our six-day stay there, timed to the 70th anniversary of the country's founding by Kim Il Sung, we were brought to witness a classic set of North Korean spectacles. Chief among them were the massive parades — one during the day to showcase the county's military power; the other, at night by torchlight, a display of a population in actual lockstep. 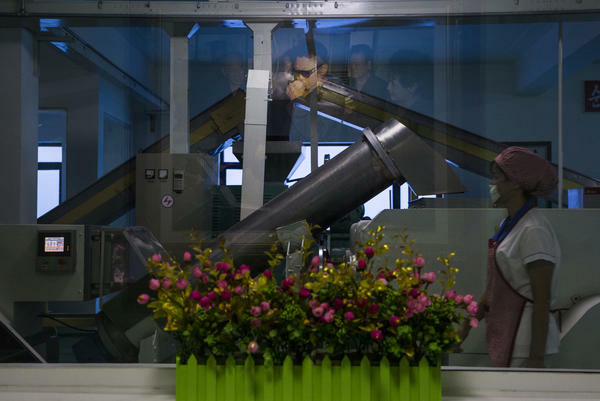 We were taken on highly orchestrated tours of factories, a school and a farm. The country and its message are still tightly controlled by the grandson of North Korea's founder. 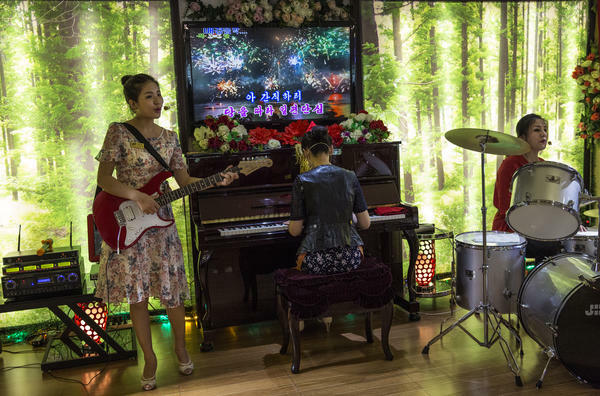 We sought to both document these events and look beyond them for a glimpse at normal life for North Koreans. In those moments, and in between them, we saw a changing North Korea that was at turns impressive, surreal, beautiful, melancholy and human. Some things, of course, remain the same. Foreign journalists visiting North Korea still can't report freely. Government guides accompanied us at all times. After the itinerary of official events ended, our government minders took us only to tourist destinations and restaurants. Government guides tend to start from a place of distrust. They sometimes scold photographers pointing cameras at people doing everyday things: a man washing a car, a woman walking along an older bridge, a farmer with his ox cart. They often say that these images will embarrass rather than humanize. It is possible to overcome that sentiment with time. Foreign journalists who have made repeated trips to the country have been able to build a level of trust with their government guides. For us, six days was not enough. Speaking to North Koreans is also complicated. Journalists can't simply interview whomever we like. The government controls whom we speak to, even whom we see. Above all, dissidence in North Korea is dangerous. Citizens risk political imprisonment for voicing critical opinions about the Kim regime, even in the confidence of their own family and friends. For years, the country barred foreigners from bringing in cellphones, and images of North Korea were rare. While the rest of the world descended into selfies, Instagram and Snapchat, the flow of photographs from North Korea remained tightly controlled by the government, which produced most images seen in the West. Then, in early 2013, the country added a 3G mobile Internet network for foreigners and allowed them to bring cellphones in for the first time. The world's most closed society opened a sliver. 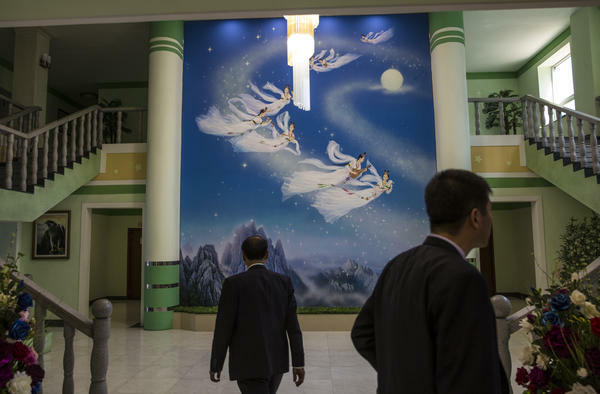 Now, practically everyone who visits North Korea — journalists and tourists alike — takes and shares photos with their phones, capturing their own moments of spontaneity and humanity. Those of us outside North Korea are seeing more of the country than ever before. 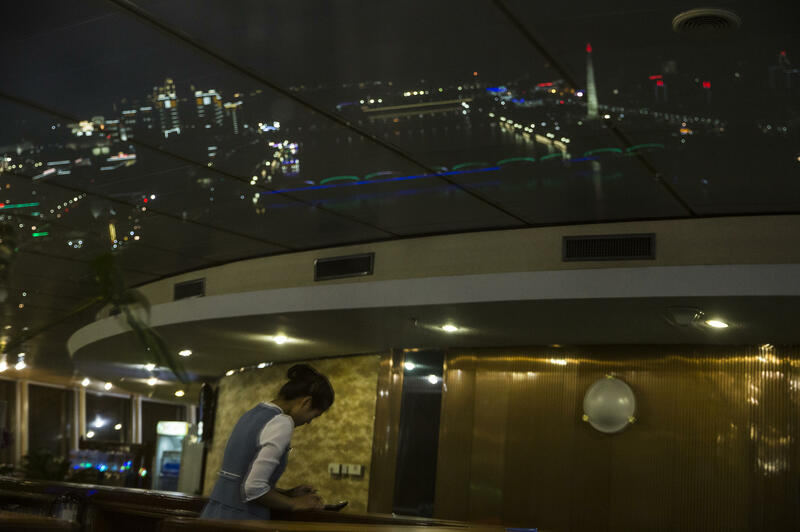 For North Koreans, access to the global Internet remains restricted to a very small group of well-connected elites and government employees. 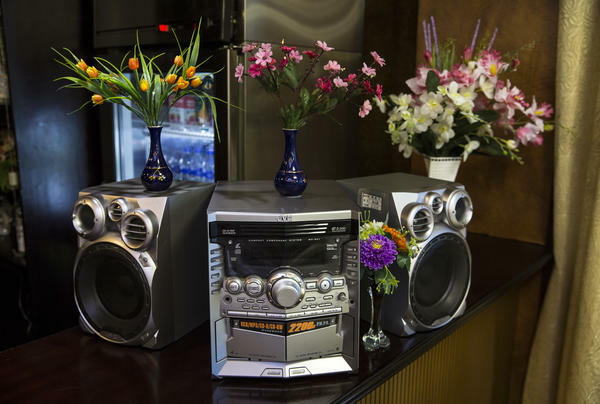 For the vast majority of citizens, the North Korean government maintains a closed intranet with limited content. 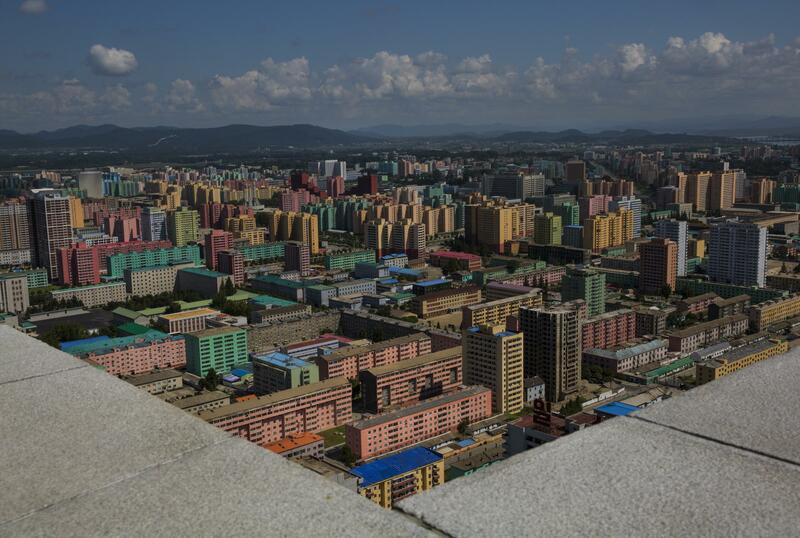 The capital city of Pyongyang is in the midst of a dramatic facelift. 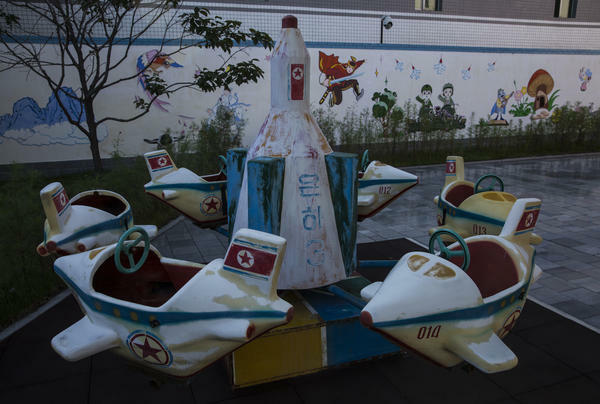 During the Korean War, most of the city was flattened by a sustained U.S. bombing campaign. Rebuilding began after the end of hostilities in 1953. No private development meant no variety in architecture. Soviet-style raw concrete apartment blocks, gray and looming, dominated. The wide paved boulevards, multiple lanes across in each direction, were famously empty of traffic. Within the past decade, dozens of new skyscrapers — retro-futuristic in style, with curves and glass — have been constructed all over the city. The older buildings have been repainted with bright candy shades of coral red, seafoam green and sky blue. There are taxis now, and new cable cars have replaced the old trolleys. A growing class of Pyongyang elite wealthy enough to own their own cars means there's honest-to-god traffic at times. The people on the sidewalks, too, seem more modern, their hair a little less conservative and clothes a little more colorful. At Pyongyang's airport, a new international terminal opened in 2015. It's the very model of a modern airport: high ceilings, glass walls, jetways, coffee shops, restaurants and duty-free stores inside. Still, it's North Korea. These amenities serve the passengers of roughly two flights a day in and out. The only destinations are China and Russia. 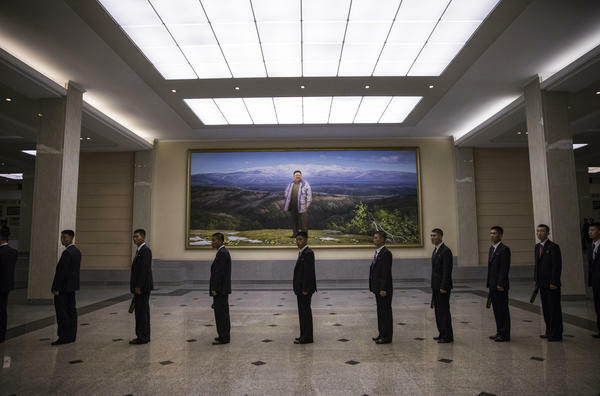 Another thing unchanged in the face of this development is Pyongyang's most distinctive civic feature: Likenesses of the country's two previous leaders, Kim Il Sung and Kim Jong Il, are everywhere. The father and son smile benevolently in their official portraits, which hang above public squares and building entryways and classroom chalkboards. 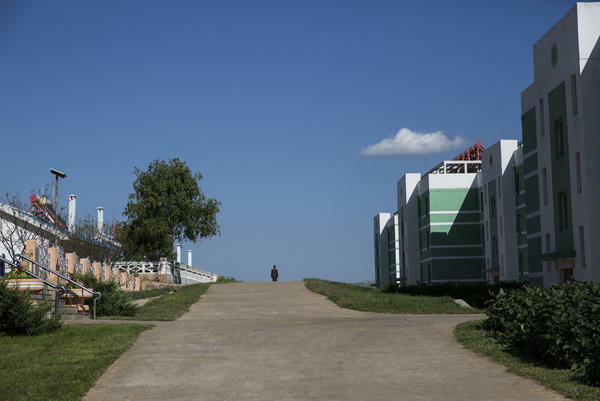 One pair of statues on Mansu Hill in Pyongyang stands more than 60 feet tall. 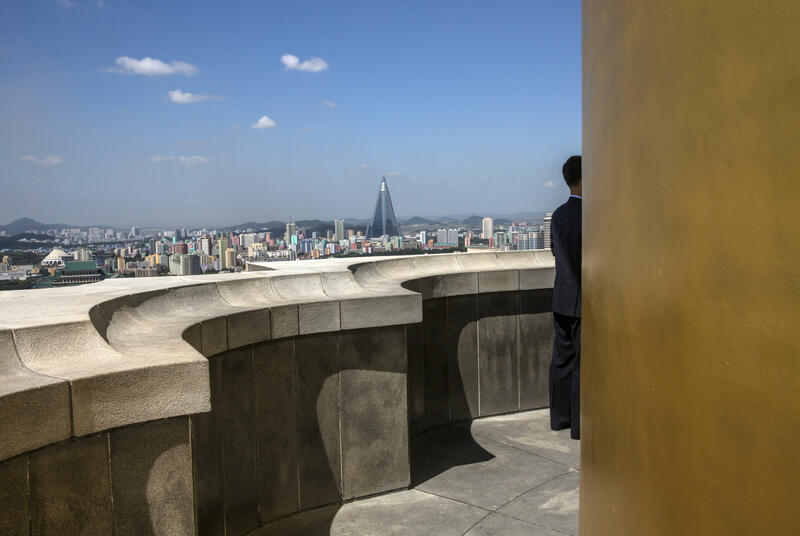 Our visit to North Korea in early September was timed to a significant moment for the country, the 70th-anniversary celebration of its founding. But it was only one important moment in a year of many, with more to come. A week after we left Pyongyang, South Korean President Moon Jae-in arrived, greeted by a crowd of 150,000 North Koreans. Before the year is out, Kim is expected to meet a third time with Moon and a second time with President Trump. Yet this isn't the first time North Korea has seemed to embrace diplomacy. Relations warm, and cool, and warm again. Meanwhile, life for North Koreans changes at its own pace. For all the colorful new paint, there are still military parades. For all the VR headsets in a classroom, there are still government minders watching our every step. For all the new cars, the supermarkets, the Italian restaurants, the occasional smartphone, there is still the old Japanese boombox on the bar, four vases of flowers placed carefully around it.